The Heritage House Check Black Collection features the quintessential country checked fabric in black and a light shade of tan. This is for the 6 inch shade. Special order. For an on-trend geometric look, this lamp shade features a seafoam green and white cotton fabric with Greek key pattern. This is for the 10 inch size. Features cobalt blue cotton and white fabric in a striking chevron pattern. This is for the 14 inch Drum Lamp Shade. Sienna Plaid Lamp Shade, by Raghu. Sienna Plaid features a plaid of dark cinnamon red wiht black and nutmeg tan. This is for the 6 inch shade (10 inch shown in photo). Bradford Oat Lampshade, by Raghu. The Bradford Oat Collection features a simple solid oat-colored slightly textured cotton fabric. This is for the 14 inch shade. Measures 6 inches across the top, 14 inches along the bottom, and 10.5 inches high. Attaches via washer on the top of the shade (which is designed to go on a harp/finial style lamp). 10 inch Black and White Chevron Drum Lamp Shade, by Raghu. For an on-trend neutral geometric look, this lamp shade features a black and white cotton fabric with chevron pattern. This is for the 10 inch size. 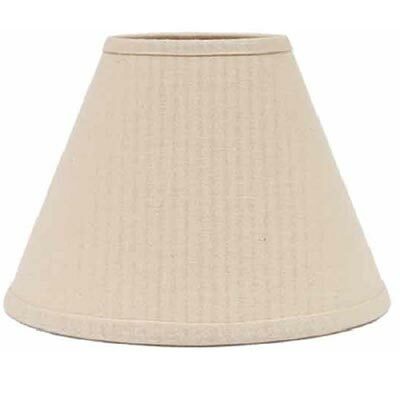 For an on-trend neutral geometric look, this lamp shade features a tan and white cotton fabric with chevron pattern. This is for the 10 inch size. Most styles come in 6 inch, 10 inch, and 12 inch, plus some 14 inch, 16 inch, as well as drum shades in 10 inch, 14 inch, and 16 inch. 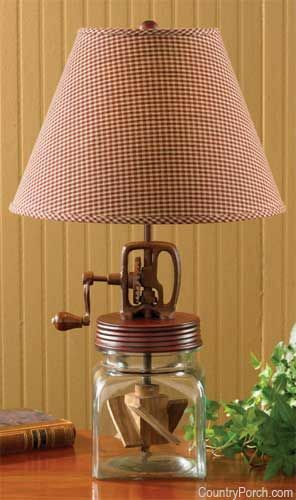 This versatile lamp will add a warm glow to any room, with it’s punched tin lamp shade! Fill the dish with potpourri, rosehips, a pip berry candle ring, or other decorative elements for that extra touch. Features white cotton fabric with cobalt blue trim along the bottom and top. This is for the 16 inch Drum Lamp Shade. The Marshfield Jacquard features a black and tan color palette and woven design. This is for the 10 inch shade. Nothing says country like buffalo check! 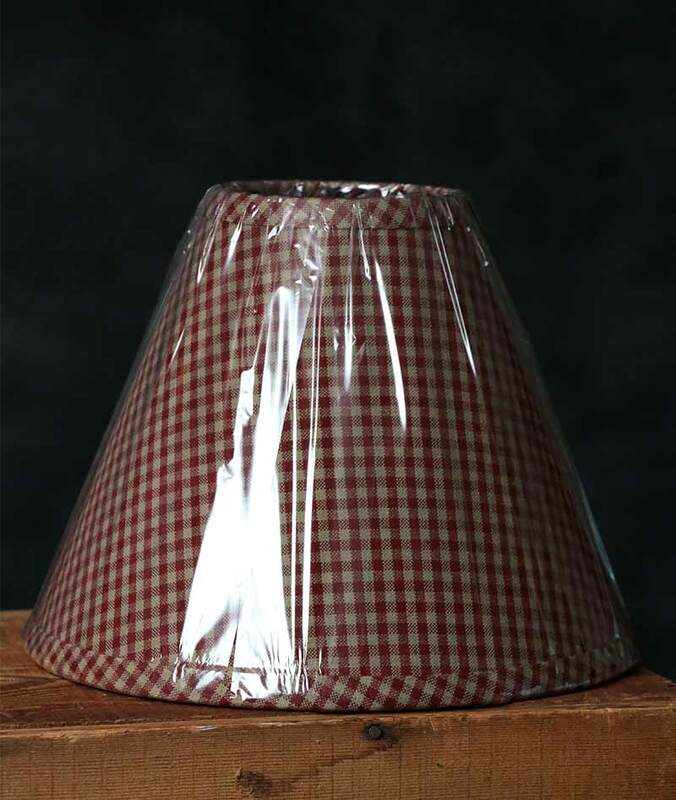 Top a favorite lamp with this cheerful red and white large checkered pattern lamp shade – this is for the 10 inch size. Nothing says country like buffalo check! Top a favorite lamp with this cheerful blue and white large checkered pattern lamp shade – this is for the 10 inch size. Candlewicking Taupe Lampshade, by Raghu. The Candlewicking Taupe Collection features cream-colored embroidered floral and leaf designs against a taupe cotton fabric. This is for the 12 inch shade. Measures 6 inches across the top, 12 inches across the bottom, and 8 inches high. Attaches via regular clip. 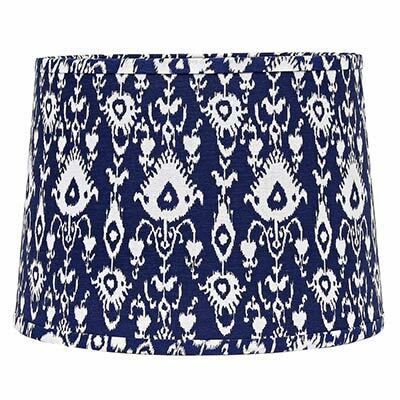 For an on-trend classy geometric look, this lamp shade features a cobalt blue cotton fabric with quatrefoil pattern. Nothing says country like buffalo check! 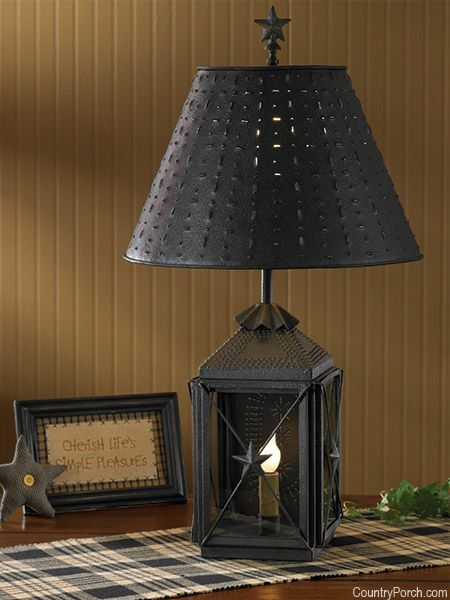 Top a favorite lamp with this cheerful black and white large checkered pattern lamp shade – this is for the 16 inch size. Bella Trace Lampshade, by Raghu. The Bella Trace Collection features a classic burlap-like woven cotton fabric in a natural wheat color. This is for the 16 inch shade. Osenburg Cream Lamp Shade, by Raghu. The Osenburg Collection is a cream colored cotton fabric reminiscent of natural, coarsely-woven osenburg fabric. This is for the 6 inch shade. Measures 2.5 inches across the top, 6 inches across the bottom, and 4. 5 inches high. Attaches via candle clip. The Heritage House Check Red Collection features the quintessential country checked fabric in burgundy red and a light shade of tan. This is for the 16 inch shade. Special order. Features a tea-dyed cotton fabric with black stenciled image of vintage Old Crow wheat advertisement with crow image. This is for the 10 inch Drum Lamp Shade. The Farmhouse Solid Buttermilk Collection is a versatile neutral ivory, the color of warm buttermilk! This is for the 14 inch lamp shade. The Heritage House Check Red Collection features the quintessential country checked fabric in burgundy red and a light shade of tan. This is for the 12 inch size. Special order. Perfect for a clean modern home decor look, this lamp shade features white cotton fabric with orange trim along the bottom and top. 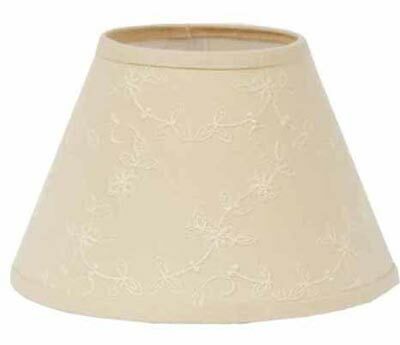 This is for the 14 inch Lamps Shade. 10 inch Black and Natural Chevron Drum Lamp Shade, by Raghu. For an on-trend neutral geometric look, this lamp shade features a black and natural tan cotton fabric with chevron pattern. This is for the 10 inch size. The Bradford Oat Collection features a simple solid oat-colored slightly textured cotton fabric. This is for the 10 inch shade. Bella Trace Lampshade, by Raghu. The Bella Trace Collection features a classic burlap-like woven cotton fabric in a natural wheat color. This is for the 12 inch shade. Measures 6 inches across the top, 12 inches across the bottom, and 8 inches high. Attaches via regular clip. Features cobalt blue cotton and white fabric in a striking chevron pattern. This is for the 10 inch Drum Lamp Shade. Features cobalt blue cotton and white fabric with beautiful ikat pattern. This is for the 14 inch Drum Lamp Shade. 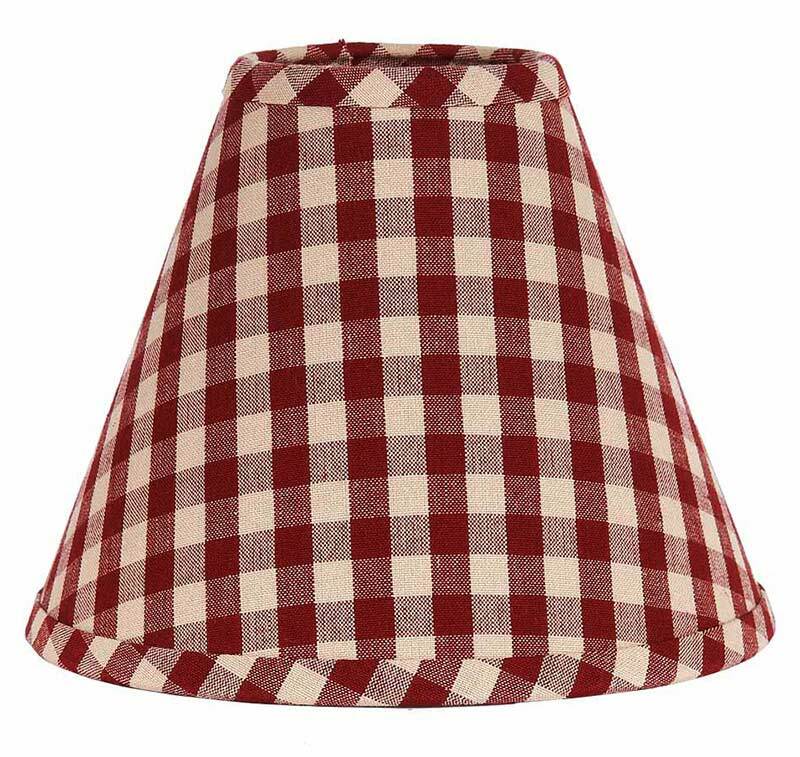 Newbury Red Gingham Lamp Shade, by Raghu. The Newbury Red Gingham Collection features a mini-check pattern of barn red and cream. This is for the 12 inch shade. Measures 6 inches across the top, 12 inches across the bottom, and 8 inches high. The Bella Trace Collection features a classic burlap-like woven cotton fabric in a natural wheat color. This is for the 10 inch shade. 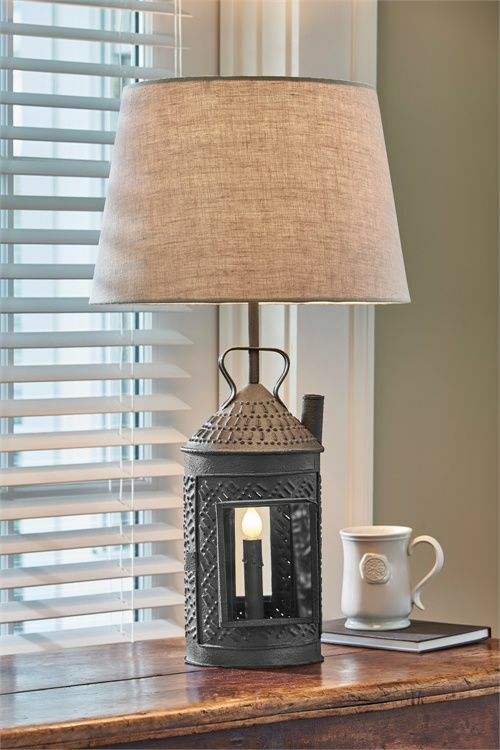 We carry the complete line of lamp shades by Raghu – dozens of country lamp shades, primitive lamps shades, beach lamp shades, burlap lamp shades, plus designs for your country home decor – roosters, coffee, checks, plaid, florals, and solid! 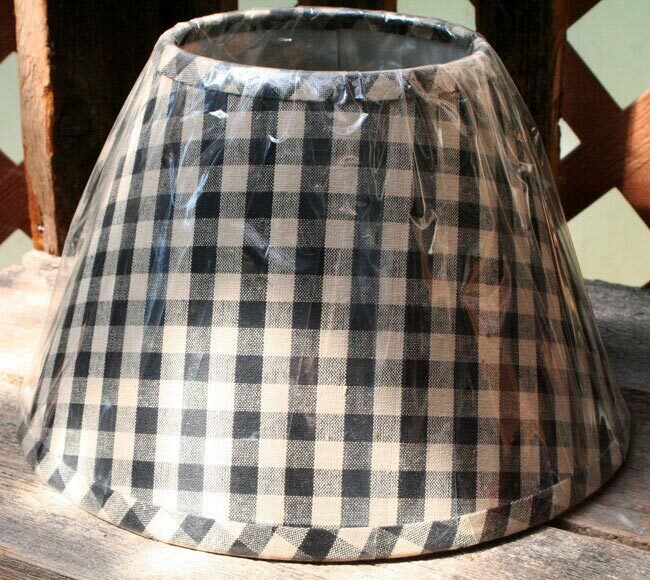 Newbury Black Gingham Lamp Shade, by Raghu. The Newbury Black Gingham Collection features a mini-check pattern of black and cream. This is for the 14 inch shade (10 inch shown in photo). Features cobalt blue cotton white embroidery in the shape of a sea shell. This is for the 14 inch Drum Lamp Shade. The Heritage House Check Red Collection features the quintessential country checked fabric in burgundy red and a light shade of tan. This is for the 14 inch shade. Special order. Features a tea-dyed cotton fabric with black stenciled image of vintage Mason Jar advertisement. This is for the 10 inch Drum Lamp Shade. The Candlewicking Cream Collection features cream-on-cream embroidered floral and leaf design. This is for the 10 inch shade (12 inch shown in photo). The Farm House Solid Buttermilk Collection features a versatile solid cream/buttermilk colored cotton fabric. This is for the 6 inch shade. The Heritage House Check Black Collection features the quintessential country checked fabric in black and a light shade of tan. This is for the 14 inch shade. Special order. Features burlap fabric with orange trim along the bottom and top. This is for the 14 inch Lamps Shade. This Indentured Lampshade, by Raghu. The This Indentured Collection features old fashioned scripted hand-writing beige background the color of aged parchment. This is for the 6 inch size. The Heritage House Check Black Collection features the quintessential country checked fabric in black and a light shade of tan. This is for the 10 inch size. Special order. York Mini-Check Lampshade, by Park Designs. This woven lampshade is a design of sage green and ecru mini checks – This is for the 12 inch lampshade (10 inch shown in photo). Nothing says country like buffalo check! 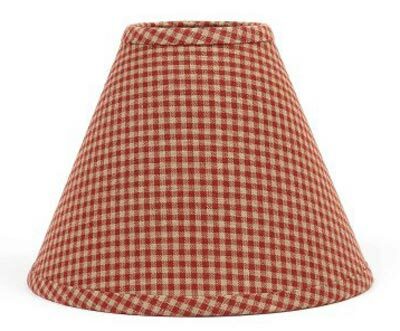 Top a favorite lamp with this cheerful red and white large checkered pattern lamp shade – this is for the 16 inch size. Display a warm country welcome in any room of your home with this primitive lamps shade, featuring the familiar hospitality symbol: the pineapple! This is for the 10 inch shade. Features cobalt blue cotton and white fabric with beautiful ikat pattern. This is for the 10 inch Drum Lamp Shade. Features cobalt blue cotton and white fabric with beautiful ikat pattern. This is for the 16 inch Drum Lamp Shade. Features a woven cotton burlap fabric with stenciled red striping. This is for the 10 inch Drum Lamp Shade. Perfect for a clean and striking look for a variety of home decor styles, this lamp shade features solid black cotton fabric. This is for the 14 inch Lamps Shade. Features a woven cotton burlap fabric with stenciled black striping. This is for the 10 inch Drum Lamp Shade. Nothing says country like buffalo check! 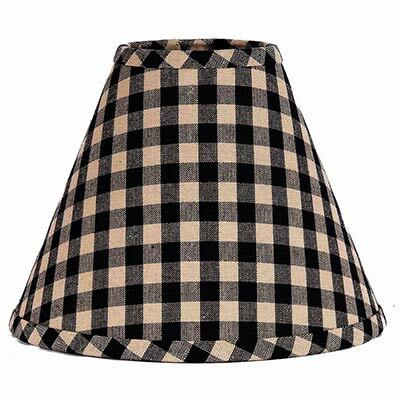 Top a favorite lamp with this cheerful black and white large checkered pattern lamp shade – this is for the 10 inch size. Williamsburg Check Lampshades, by Raghu. This is for the BLACK shade in the Williamsburg checked pattern, which is black and light tan (not white). This is for the 6 inch shade (12 inch shown in photo). The Farm House Solid Buttermilk Collection features a versatile solid cream/buttermilk colored cotton fabric. This is for the 10 inch shade. Farm House Solid Lampshades, by Raghu. The Farm House Solid Buttermilk Collection features a versatile solid cream/buttermilk colored cotton fabric. This is for the 12 inch shade. Measures 6 inches across the top, 12 inches across the bottom, and 8 inches high. Attaches via regular clip. Features cobalt blue cotton and white fabric in a striking chevron pattern. This is for the 16 inch Drum Lamp Shade. The Candlewicking Cream Collection features cream-on-cream embroidered floral and leaf design. This is for the 6 inch shade. Penneyhill Plaid Lamp Shade, by Raghu. The Penneyhill Plaid Collection features windowpane check pattern of barn red and nutmeg against a black background. This is for the 6 inch shade. Features cobalt blue cotton white embroidery reminiscent of sea coral. This is for the 14 inch Drum Lamp Shade. 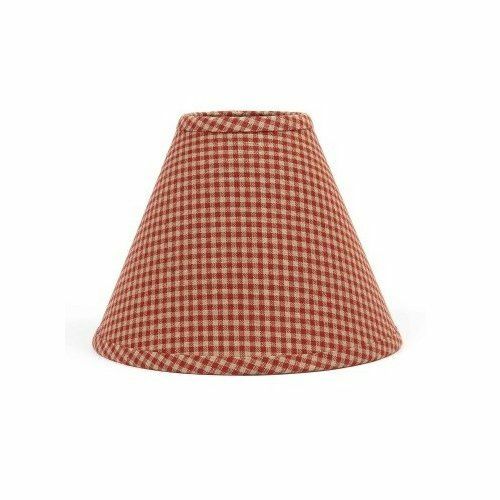 Newbury Red Gingham Lamp Shade, by Raghu. The Newbury Red Gingham Collection features a mini-check pattern of barn red and cream. This is for the 6 inch shade (10 inch shown in photo). Perfect for a clean modern home decor look, this lamp shade features white cotton fabric with lime green trim along the bottom and top. This is for the 14 inch Lamps Shade. Candlewicking Cream Lampshade, by Raghu. The Candlewicking Cream Collection features cream-on-cream embroidered floral and leaf design. This is for the 12 inch shade. The Burlap Collection features a barn red fabric stripe on a natural jute burlap background. This is for the 10 inch shade. Perfect for a clean modern home decor look, this lamp shade features white cotton fabric with black trim along the bottom and top. This is for the 14 inch Lamps Shade. The Burlap Collection features a black fabric stripe on a natural jute burlap background. This is for the 10 inch shade. Features white cotton fabric with cobalt blue trim along the bottom and top. This is for the 14 inch Drum Lamp Shade. Ellie Rose Lamp Shade, by Raghu. The Ellie Rose Collection features a pretty, shabby-chic style cotton fabric with a peony rose in pinks and sage green leaves against a cream colored background. This is for the 14 inch DRUM-style shade. Measures 12 inches across the top, 14 inches across the bottom, and 9.25 inches high. Attaches via washer top to a harp-style lamp. The Heritage House Check Red Collection features the quintessential country checked fabric in burgundy red and a light shade of tan. This is for the 6 inch, chandelier style lamp shade. The Heritage House Check Black Collection features a classic checked cotton in black and light tan. Check size is about 1/2 inch. This is for the 12 inch shade. For a simple, elegant modern look, this drum lamp shade features white cotton fabric with black trim along the bottom and top. This is for the 10 inch size. Features natural tan burlap fabric with cobalt blue trim along the bottom and top. This is for the 16 inch Drum Lamp Shade. Burlap Black Lamp Shade, by Raghu. The Burlap Collection features a black fabric stripe on a natural jute burlap background. This is for the 12 inch shade (10 inch shown in photo). The Bradford Oat Collection features a simple solid oat-colored slightly textured cotton fabric. This is for the 12 inch shade (10 inch shown in photo). Burlap Red Lamp Shade, by Raghu. The Burlap Collection features a barn red fabric stripe on a natural jute burlap background. This is for the 12 inch shade. Measures 6 inches across the top, 12 inches across the bottom, and 8 inches high. Attaches via regular clip. Features cobalt blue cotton fabric with quatrefoil pattern in grey and white. This is for the 16 inch Drum Lamp Shade. The Candlewicking Taupe Collection features cream-colored embroidered floral and leaf designs against a taupe cotton fabric. This is for the 10 inch shade. Penneyhill Plaid Lampshades, by Raghu. The Penneyhill Plaid Collection features windowpane check pattern of barn red and nutmeg against a black background. This is for the 10 inch shade. Features cobalt blue cotton fabric with quatrefoil pattern in grey and white. This is for the 14 inch Drum Lamp Shade. The Newbury Black Gingham Collection features a mini-check pattern of black and cream. This is for the 10 inch shade. he Heritage House Check Red Collection features the quintessential country checked fabric in burgundy red and a light shade of tan. This is for the 10 inch shade. Special order. The Newbury Black Gingham Collection features a mini-check pattern of black and cream. This is for the 12 inch shade (10 inch shown in photo). For an on-trend geometric look, this lamp shade features a black and white cotton fabric with Greek key pattern. This is for the 10 inch size. Osenburg Cream Lamp Shade, by Raghu. The Osenburg Collection is a cream colored cotton fabric reminiscent of natural, coarsely-woven osenburg fabric. This is for the 12 inch shade. 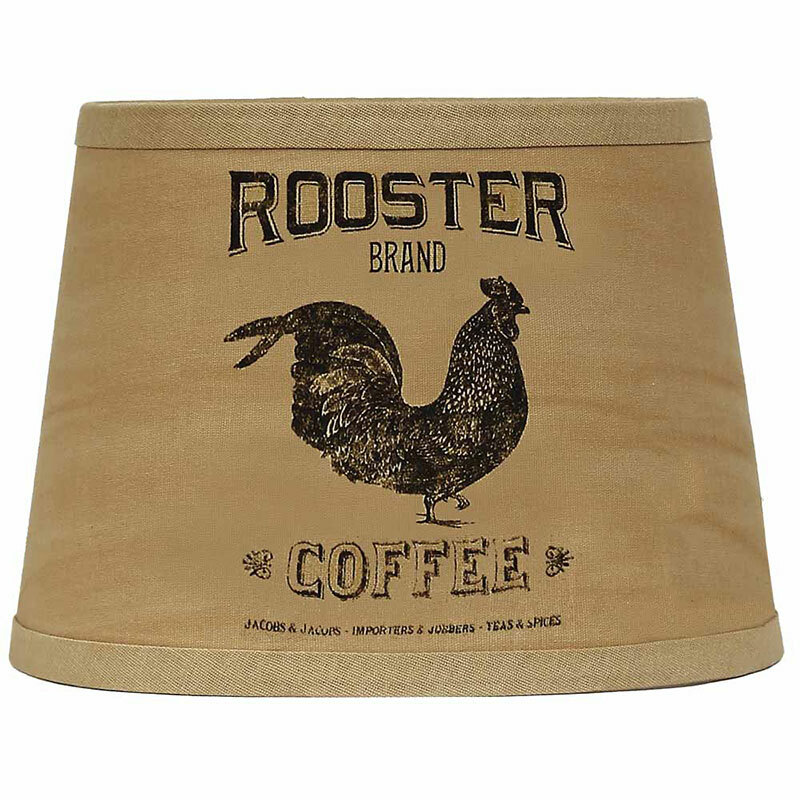 Features a tea-dyed cotton fabric with black stenciled image of vintage coffee advertisement with rooster image. This is for the 10 inch Drum Lamp Shade. Rooster Lampshade, by Raghu. 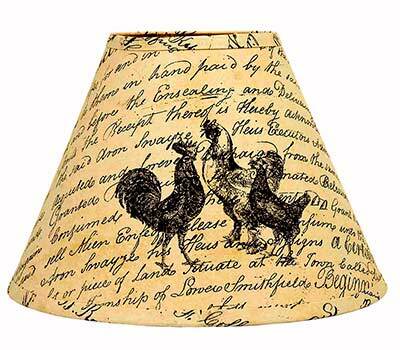 The Rooster Collection features old fashioned scripted hand-writing and vintage rooster images in black against a tea-dyed background the color of aged parchment. This is for the 10 inch shade. Measures 4 inches along the top, 10 inches along the bottom, and 8 inches high. Attaches via regular clip. Crewel Lamp Shade, by Park Designs. Ivory color with ivory crewel work in vines and flowers. This is the 12 inch size. We keep some stock on hand, but most are special ordered, which allows us to offer you Raghu’s complete collection. Please allow approx 3 weeks for special order items to arrive to us before shipping out to you! The Newbury Red Gingham Check Collection features a classic country gingham check fabric in burgundy red and a light shade of tan. This is for the 10 inch shade. The Osenburg Collection is a cream colored cotton fabric reminiscent of natural, coarsely-woven osenburg fabric. This is for the 10 inch shade. White Pleated Lamp Shade with Pearls, by Light & Living. White fabric shade, with small pleated tucks and accented with mini pearls. Measurements: 8 inches in diameter at the top, 12 inches in diameter at the bottom, and 7 inches high. Attaches via washer ring that rests atop the top socket of the lamp, and the light bulb screws in over the ring. The Candlewicking Taupe Collection features cream-colored embroidered floral and leaf designs against a taupe cotton fabric. This is for the 6 inch shade. The Lover’s Knot Jacquard features a black and tan color palette and woven “lover’s knot” design, a traditional symbol of love, friendship and affection. This is for the 10 inch shade. White Pleated Lamp Shade with Pearls, by Light & Living. White fabric shade, with small pleated tucks and accented with mini pearls. Measurements: 3 inches in diameter at the top, 5.5 inches in diameter at the bottom, and 5 inches high. Attaches via candle clip over a torpedo style bulb. Bella Trace Lampshade, by Raghu. The Bella Trace Collection features a classic burlap-like woven cotton fabric in a natural wheat color. This is for the 14 inch shade. Measures 6 inches across the top, 14 inches along the bottom, and 10.5 inches high. Attaches via washer on the top of the shade (which is designed to go on a harp/finial style lamp). The Heritage House Check Black Collection features the quintessential country checked fabric in black and a light shade of tan. This is for the 16 inch shade. Special order. The Salem Check Black Collection features windowpane check pattern of black against a cream background. This is for the 10 inch shade. Emily’s Floral Drum Lampshade, by Raghu. The Emily’s Floral Collection features a slightly floral, slightly geometric pattern in cream against an oat colored cotton background. This is for the DRUM shad. Nothing says country like buffalo check! Top a favorite lamp with this cheerful blue and white large checkered pattern lamp shade – this is for the 16 inch size. Features natural tan burlap fabric with cobalt blue trim along the bottom and top. This is for the 14 inch Drum Lamp Shade. Simple woven cotton fabric lampshade in a wheat color. This is for the 12 inch size (bottom diameter measurement). 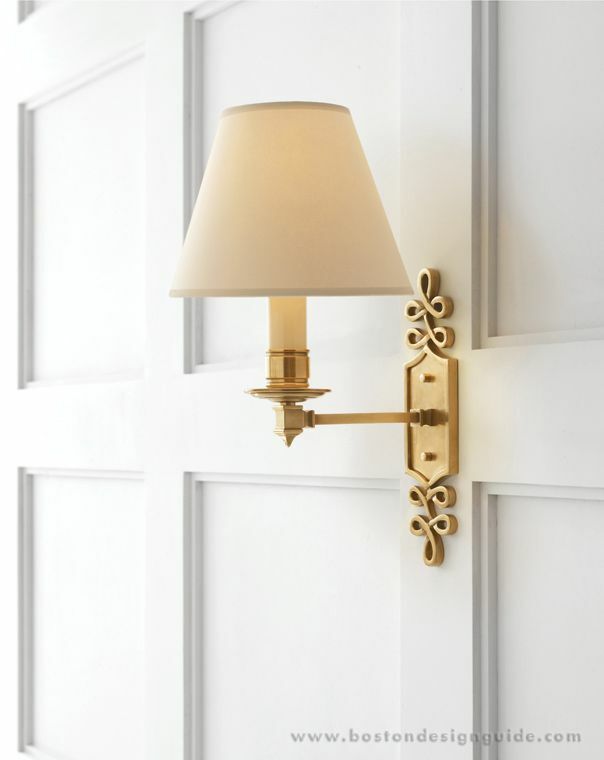 Attaches via washer at the top, to a harp-and-finial-style lamp.